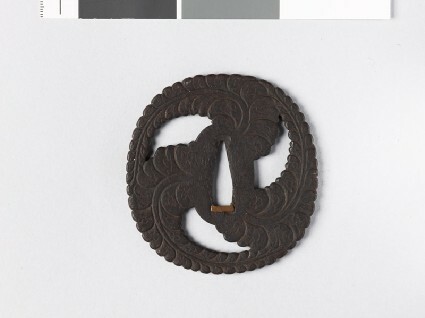 Flatly modelled as the badge mitsu-fuji-domoye, three racemes of wisteria, each of comma shape, with their heads impinging on the seppadai, leaving three tapering perforations. The badge was borne by the Shinjō, a daimiō family. The guard, now plain, was perhaps originally decorated with gold nunome. Sir Arthur Church, in his manuscript catalogue, states that when he acquired it, the signature was invisible, as were many of the details, owing to being blocked up with rust.